Sixteen years ago this morning, sixteen years ago right now, four passenger planes wrecked the blissful ignorance in which we Americans had been living since the last time we were attacked, on a Sunday morning in December 1941. In 2001, we were riding high. We’d survived Y2K with nary a blink, far from the worldwide technological Armageddon dooms-sayers had predicted. George W. Bush had taken the oath of office in January, and things were good. Then September 11th came, and with it, new ideas of terrorism and fear entered the American conscious, and new names became known to us – Osama bin Laden and Al Qaeda. Our innocence was shattered. Things were no longer good, we were no longer safe, and our fighting men and women soon were going to war. 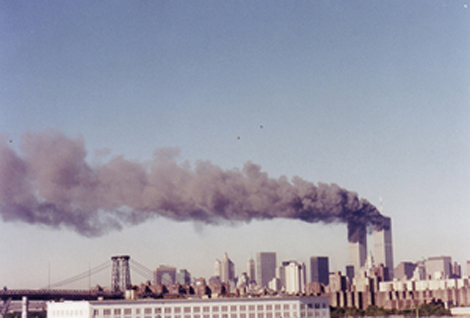 A view of the Twin Towers under attack on 9/11 2001. Sometimes in life, we have our own personal ends of blissful ignorance. Mine came on 11 September last year. Like the catastrophe that happened in America on that fateful day sixteen years ago, my own end of innocence was brutal and tough, and it taught me to be more cautious. I had a good friend, a best friend, someone I’d entrusted with much. He and I had been friends for several years and always enjoyed spending time together. The night before the end of my blissful innocence, I took the plunge and dared to share something precious and scary with him, the first time I’d shared anything of the sort with someone outside of my own nuclear family. What I shared isn’t important to relate here, but sharing it opened up an old wound, leaving me feeling raw, vulnerable, and tired. We were doing this by text, and he texted back his gratitude that I’d shared that and his understanding of how important it was. This opened my eyes to something I had been reluctant to acknowledge: I needed to cut this person out of my life. This friendship had ceased to be healthy for me, and if I were going to grow into my next phase of life wholly, then it was necessary to start with a serious pruning, cutting away the dead parts of my life that weren’t helping the good parts flourish. With some sadness, admittedly, I severed all ties with this person – everything from phone calls to the more inane Twitter follow. I was sad for a little while, but once that passed, I felt lighter, fresh, healed, and whole once more. This happens to all of us at one point or another. Someone in our lives is more of a burden than a blessing. Perhaps it’s that grown child who’s always asking for money. Maybe it’s that sibling who doesn’t like the way you’re caring for Mom and Dad, though they’re always “too busy” to help. It could be that person at church who keeps asking and asking and asking you to do something, refusing to take “no” for an answer. It quite possibly could be that family member who hears your “no,” but then pulls out every manipulative trick to guilt you into turning it into a “yes.” Maybe it’s that friend who takes everything you have to offer, then when you’re tapped out or refuse their demands for more, they claim you never give them anything. There comes a time when we have to say, “No,” and walk away. That’s what I did in this situation. I said “no” to the emotional blackmail, gaslighting, and blame game. Putting up with that mess just wasn’t worth what was passing for friendship. Walking away often isn’t to punish the other person, but to save ourselves. If there is someone in your world who is preventing or hindering you from living into your wholeness and fullness as one of God’s gloriously created beings, it’s time to get out the scissors and cut them out of your life. It’s time at least to say “No” with meaning and walk away from their soul-sucking behavior. Live into who you are meant to be. This entry was posted in Holy Living and tagged 9/11, emotional health, Godly living, Holy Living. Bookmark the permalink.